Who invented the world's very first car? Who invented the first car? If we're talking about the first modern automobile, then it's Karl Benz in 1886. But long before him, there were strange forerunners to the today's cars, including toys for emperors, steam-powered artillery carriers, and clanking, creaking British buses. Humans have possessed knowledge of the wheel for several thousand years, and we've been using animals as a source of transportation for nearly that long. So, in some sense, the earliest forerunners of the car date back to the earliest mists of our prehistory. But perhaps a more useful way of thinking of the car is anything that could reasonably be called an "automobile" - in other words, any vehicle capable of propelling itself. In that case, we're at most talking about 439 years of car history. The very first car might well have been the invention of a Flemish missionary named Ferdinand Verbiest. Born in Flanders in 1623, Verbiest was an accomplished astronomer who left Europe for China in 1658. He helped to modernize the now outmoded Chinese astronomy using recent European innovations, and he was asked by the emperor to become the director of the newly refurbished Beijing Ancient Observatory. What's more, he spoke at least five languages fluently, wrote thirty books, was a skilled diplomat and mapmaker, and tutored the long-lived Kangxi Emperor in everything from mathematics to poetry. He was, even by the standards of the time, ridiculously accomplished. But the reason why we're talking about Verbiest here is that he might - emphasis on might - have invented the world's first car. According to Verbiest's own text Astronomia Europea, he built a small, self-propelled vehicle. Steam technology was still in its infancy at the time, but Verbiest was able to build a rudimentary, ball-shaped boiler, which then forced steam towards a turbine that could turn the back wheels. Verbiest says the vehicle was meant to be a toy for the emperor. Considering this is over 200 years before the construction of what's generally considered the first modern automobile, this is a remarkable achievement, but there are some pretty big caveats here. I said the car was small, and it was: about two feet long, far too tiny for any human to ride in it. It's also not at all clear whether the toy was ever built, or if it purely existed as a design in Verbiest's imagination. To some extent, 1672 might seem surprisingly recent for the first car ever. After all, we keep discovering far more ancient analogues for modern items, including everything from Babylonian museums to Roman fishtanks. So why haven't we discovered an ancient Egyptian car inside the pyramids, or even some medieval gadgetry that vaguely approximates an automobile? The wagon existed in its animal-drawn form for thousands of years before it was possible to make it self-propelled, literally "auto-mobile." In the process, motorized vehicles were far removed from the center of scientific and mechanical inquiry. From the end of the seventeenth century, existing vehicular technology was more than adequate to meet societal demands. In the age of absolute monarchs and mercantilism, it was more important to solve other engineering challenges that were difficult or impossible to achieve with conventional energy sources such as muscle, wind, or water power. And what were these more important engineering challenges? As Eckermann explains, "the fountains and water displays of baroque gardens" were a higher priority for inventors and scholars than was the creation of a self-propelling vehicle. While no one was really tackling this subject directly, the legendary Dutch scientist Christian Huygens did take a crucial step towards the car in 1673, one year after Verbiest reputedly began work on his toy for the emperor of China. Huygens built upon previous experiments by other scientists to create a simple engine powered by, awesomely enough, gunpowder. By exploding the material inside a cylinder, Huygens was able to create a vacuum, which in turn forced a piston to move down the cylinder. This created work, making it effectively the earliest recognizable forerunner of the internal combustion engine. And, for his part, Huygens immediately recognized the engine's potential as a power source for land and water vehicles alike, but his engine was far too primitive to be of much use in that direction. The 1700s were dominated by various inventors working to perfect the steam engine - Thomas Newcomen and James Watt are probably the most famous of these, but there were many more. But the first person to take a steam engine and place it on a full-sized vehicle was probably a Frenchman named Nicolas-Joseph Cugnot, who between 1769 and 1771 built a steam-powered automobile more than thirty years before the railway's first steam locomotive. Cugnot's design was, to put it mildly, unique. The contraption weighed about 2.5 tons, had two big wheels in the back and a single thick central wheel at the front, and could seat four people. The boiler was placed well out in the front, which made the vehicle even more fiendishly difficult to control. While its top speed was meant to be about five miles per hour, it never even got close to that fast in practice. Opinion is somewhat divided over how well the thing actually worked - in fairness, various government ministers were supposed to be impressed with the initial trials - although most agree that it had poor weight distribution and so was unable to handle even moderately rough terrain. Since its intended purpose was as a transport for heavy artillery on the battlefield, that has to be considered a drawback. One story says that the second of Cugnot's two vehicles crashed into a wall in 1771, which might make it the first ever automobile accident. It's a good story, but unfortunately no one wrote about it until 1801, some thirty years later, which makes it rather more likely that this was just a bit of folklore. Either way, here's a rather awesome reconstruction of the crash, completely with ludicrously over-the-top reaction shots. As France fell into the grips of revolution, Cugnot's work was largely forgotten, and the next big innovations in automobile technology came in Britain. Over the next several decades, various inventors worked on steam carriages, which resembled a cross between buses and rail locomotives. William Murdoch created a working model of one of these in 1784, but it wouldn't be until the beginning of the 19th century that Richard Trevithick was able to get a full-sized vehicle on the road. Steam-powered mass transit had some limited success in the opening years of the 1800s, but it wasn't until the 1820s and 1830s that steam buses began gaining some measure of popularity with the British public. Further technological innovations in this early form of road-based mass transit including better brakes, a more advanced transmission, and improved steering. It was apparent that the technology was not yet fully developed, and this new means of transportation did not yet enjoy favorable public opinion. Crankshafts snapped, lines leaked, chains broke, and boilers exploded. Engine vibrations (which, unlike stationary installations, could not be overcome by mounting on a solid foundation, the pungent odor of burnt oil, and flying soot and coal dust soon drove the traveling public back to the old standby, the horse-drawn stage, or another new invention, the railway and its rapidly growing network of track. The steam buses proved to be something of a dead end, and engineers turned their attention to traction engines, which were slower, more stable machines that were basically just steam locomotives adapted for use on land. This was a move away from the line of innovation that would eventually lead to the car, but even these proved too raucous for the public at large. The Locomotive Act of 1865 said no land vehicle could travel faster than 4 miles per hour, and that all such vehicles had to be preceded by a man waving a red flag and blowing a horn. This was not, as you might imagine, the automotive industry's finest hour. There were several other attempts to build self-propelled vehicles, but none of them ever quite made that big leap to become the first practical automobile. An American inventor named Oliver Evans built the "Oruktor Amphibolis", a steam-powered dredging device that became more powerful and elaborate with each subsequent retelling, in part because Evans felt he never got proper credit for his engineering prowess. At this point, it's difficult to say with certainty exactly what the Oruktor Amphibolis was actually capable of. Russian inventor Ivan Kulibin came other with a steam-powered vehicle in the 1780s, and it featured plenty of modern automotive hallmarks, including brakes, gearbox, flywheel, and bearing. The problem is that, though it did have a steam engine component, it still required human peddling to operate, so it can't really be considered an automobile. 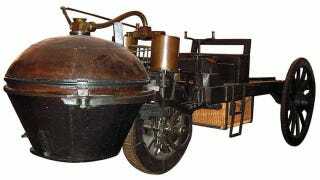 While steam remained the main focus of inventors in search of a practical automobile, the results remained difficult to control and incapable of reaching speeds much over about five miles per hour. (In fairness, subsequent innovations in the late 1800s and early 1900s did result in actually practical steam cars.) The internal combustion engine provided the pathway to the first modern automobiles, with Karl Benz generally getting the credit for the first successful invention in 1886. But now we're starting to cross over into the modern history of automobiles, so this is where I will stop. Here's to all the crazy forerunners of our modern marvel, be they Flemish polymath toymakers, Frenchmen crashing into walls, Dutchmen building engines out of gunpowder, or Brits crowding themselves onto noisy, supremely dangerous steam buses. All these innovators offer a very clear lesson: if you're going to fail to invent the automobile, at least fail with style.